America's top nuclear commander said the U.S. doesn't have defenses against hypersonic weapons. "Both Russia and China are aggressively pursuing hypersonic capabilities," said Gen. John Hyten, commander of U.S. Strategic Command. Earlier this month, Russia announced a slew of new nuclear weapons as well as hypersonic missiles. America's top nuclear commander described a grim scenario for U.S. forces facing off against a new breed of high-speed weapons that Russia and China are developing. "We don't have any defense that could deny the employment of such a weapon against us," Air Force Gen. John Hyten, commander of U.S. Strategic Command, told the Senate Armed Services Committee on Tuesday. This means that, as of now, the U.S. has to rely on deterrence against these so-called hypersonic weapons, he said. Loans from China helped Uganda build a speedy new road to its main airport. But critics say the country is now too deep in debt to Beijing. Deborah Bräutigam is the Bernard L. Schwartz Professor of International Political Economy and director of the China Africa Research Initiative at Johns Hopkins School of Advanced International Studies. Her latest book is Will Africa Feed China? In Washington, Republicans and Democrats generally look at China as a new imperial power in Africa: bad news for Africans. But is this really the case? Just before his visit to Africa last month, former secretary of state Rex Tillerson accused China of using “predatory loan practices,” undermining growth and creating “few if any jobs” on the continent. In Ethiopia, Tillerson charged the Chinese with providing “opaque” project loans that boost debt without providing significant training. As secretary of state, Hillary Clinton sang the same tune, warning Africans to beware of this “new colonialism.” China, we are often told, is bringing in all its own workers or “grabbing” African land to grow food to send back to feed China. Both the US and UK have issued warnings about the Chinese technology and telecoms giant ZTE. 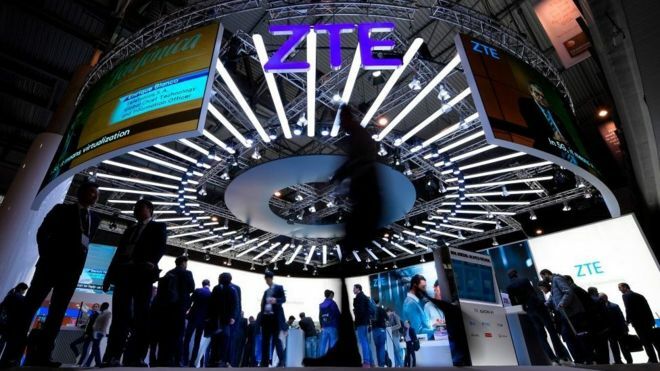 The decision by the US Commerce Department to ban American firms from selling equipment to ZTE for the next seven years dates back to a case from a few years ago, when ZTE was accused by the US government of violating sanctions against Iran. At the time, the US said if ZTE refused to comply, there would be consequences. This week, the US made good on those threats and is hitting ZTE where it hurts. A shortage of US components is likely to cause ZTE to miss shipment deadlines and lose orders, according to investment firm Jefferies. It has cut its estimates for ZTE sales by 13.5% in 2018 and 7.6% in 2019. This report originally appeared as testimony before the U.S.-China Economic and Security Review Commission. Thank you to the Commissioners for convening this hearing today and inviting me to testify. The Commission has asked me to focus on assessing China’s relations with U.S. allies and partners in Southeast Asia—specifically, Thailand, the Philippines, Vietnam, and Singapore. I was also asked to address the various tools with which China seeks to influence these countries and their relations with the United States, and to provide related recommendations to the United States Congress. The Horn of Africa is one of the most geo-strategically important regions of the world, and one of the main theatres in which the Sino-African four-pronged approach – based on economic, ideological, political and security interests – unfolds.This Policy Brief unpacks the dynamics of Chinese engagement with the Horn of Africa, with Ethiopia as a case study. The brief maintains the view that although European Union (EU) and Chinese activities in the Horn of Africa often differ in ideological and political interests, there is significant complementarity in economic and security interests. China’s new J-10C fighter jets have been put into service, which marks an improvement in the combat capabilities and defense of the Air Force of the People’s Liberation Army (PLA), the Air Force announced in a statement on Monday. The J-10C is a third generation home-made fighter with multiple functions and is equipped with an avionics system. It is also equipped with multiple advanced armament and be effective in land or sea combat, said the statement released on the official Weibo account of the PLA Air Force. The fighter jet was first revealed to the public at the military parade marking the 90th founding anniversary of the PLA in July 2017 and has attracted wide attention. SYRIA-ISRAEL BORDER, Golan Heights — Ever since the Iranian Islamic Revolution in 1979, Iran and Israel have been fighting each other in the shadows — through proxies, assassination squads and cyber-virus attacks, but never as rival armies meeting on the field of battle. That may be about to change, and if it does, it will have vast implications for Syria, Lebanon and the whole Middle East. I’m sure neither side really wants a war. It could be devastating for Israel’s flourishing high-tech economy and for Iran’s already collapsing currency. But Iran’s Revolutionary Guards’ Quds Force seems determined to try to turn Syria into a base from which to pressure Israel, and Israel seems determined to prevent that. And in the past few weeks — for the first time ever — Israel and Iran have begun quietly trading blows directly, not through proxies, in Syria. The recent chlorine attack in Douma, Syria, which reportedly killed over 40 men, women and children, prompted a predictable reaction from the international community. Governments around the world issued statements condemning the attack. The UN Security Council held an emergency meeting in response. Russia dismissed reports of the attack as false and traded insults with the U.S. Doctors scrambled inside Syria to treat those afflicted, while aid workers searched homes to locate more victims. United States and Russia are in a state of edgy military confrontation which has all the potential of a flare-up and military showdown. Inherent in this are serious implications for India and its foreign policy would be severely tested. Geopolitically, strange is the emerging reality that the United States has chosen the Middle East for a showdown with Russia where the strategic challenges to United States are much lower in scale than in Indo Pacific Asia where China has already thrown the military gauntlet in the South China Sea against the United States. Here perceptionally, the United States has shied away from a military showdown with China and where United States for safeguarding its Superpower image in Asian capitals should have challenged China. A Syrian firefighter is seen inside the destroyed Scientific Research Centre in Damascus, Syria, April 14, 2018. (Omar Sanadiki/Reuters)Plenty of future challenges remain, in Syria and elsewhere around the globe. But Friday’s strikes are victory worth celebrating.By all accounts, Friday night’s strikes against the Assad regime’s chemical-weapons facilities were successful — they reduced their targets to rubble, and there were no reported threats to allied forces or equipment in their aftermath. Armchair strategists are quick to point out that the strikes didn’t fit into any broader American Syria strategy. But the chemical-weapons attack of April 7 demonstrated, once again, the Syrian regime’s flagrant disregard for international moral and legal norms. And unlike last April’s retaliatory American strike on aircraft used for chemical-weapons delivery at Shayrat Air Base, Friday’s strikes sought to hit the heart of the regime’s chemical-weapons capabilities, and were coordinated with our oldest and closest allies. North Korean supreme leader Kim Jong Un met with Chinese president Xi Jinping last week for the first time since coming to power in 2011. Such a meeting between the two leaders would normally be not be surprising since China and North Korea are allies. But these are not normal times. The meeting between Kim and Xi took many experts by surprise because the relationship between Pyongyang and Beijing has been tense for some time. Since Kim came to power, there have been fewer high-level exchanges between Chinese and North Korean officials, and reports indicate that bilateral trade significantly decreased in recent months. Could Russia and West be heading for cyber-war? The latest warning of Russian intrusions is another sign that cyber-space is becoming one of the focal points for growing tension between Russia and the West.But so far, much of the talk about cyber-war remains hypothetical rather than real. It is true that Britain's National Cyber Security Centre (NCSC) is on high alert for the possibility of some kind of Russian activity. More people and resources have been devoted to monitoring and investigation. There has also been outreach to companies to warn them on what to look out for and what to do. How the EU responds to the Trump administration will be the hallmark of how it sees its role in the world, and how successful it will be in promoting its worldview. European Council President Donald Tusk speaks to US President Donald Trump as he welcomes him at EU headquarters in Brussels as part of a NATO meeting, 25 May 2017. The partnership between the United States and Europe has been an anchor of the world’s economic, political and security order for more than seven decades, but we should not take it for granted. The transatlantic relationship faces many dangers. However, the issues that bring the two sides together ultimately carry much greater weight than those that might divide them. The relationship between Greece and Turkey has never been easy. The neighboring countries have been at war with each other several times in the 20th century and were close to military conflict over the Greek islet Imia in 1996, before the United States stepped in to avert disaster.The NATO allies are now at the brink again, goaded by populists on both sides — and this time, Washington is nowhere to be found. On Monday, a Greek-Turkish confrontation rekindled old memories. Turkish Prime Minister Binali Yildirim, during an event in Ankara, claimed that the Turkish coast guard had removed a Greek flag from an islet near the island of Fournoi, after it was placed there earlier by three Greeks. The Hellenic National Defense General Staff responded that no Turkish boat had been seen in the area in the last 48 hours; the mayor of Fournoi then visited the islet and reported that the Greek flag was still there. Operationalizing the Decisive Point: Operation OQAB “Eagle” – Combined and Unified Action “The fight against the guerrilla must be organized methodically and conducted with unremitting patience and resolution. Except for the rare exception, it will never achieve spectacular results, so dear to laurel seeking military leaders.” -- Roger Trinquier. Modern Warfare—a French View of Counterinsurgency. 1964. [i] Trinquier accurately assessed that a deliberate and methodical process must be conducted, to defeat an insurgency that does not present a single decisive battle that turns the tide of war. The development of a methodical campaign plan for Counter-insurgency (COIN) requires planners to use a new method of thinking in the way they approach their mission. Campaign Design for COIN incorporates many non-traditional aspects to planning that many have practiced in the field yet have not be codified into doctrine until recently. Portraits of the Russian and Syrian presidents are displayed at the government-held Wafideen checkpoint on the outskirts of Damascus on April 3. Social media has emerged as a key battleground in the U.S. and Russian media campaign to promote their sharply divergent accounts of chemical weapons in Syria. The intelligence assessments presented over the weekend by the United States and France to justify missiles strikes against Syria for its alleged use of chemical weapons in a Damascus suburb relied to an unusual degree on information gleaned from open source material and social media. Russia, meanwhile, is mustering an army of internet trolls to shift blame for the chemical weapons attack. Security officials issue alert directly blaming Kremlin for attack as US warns Moscow it is ‘pushing back hard’ The decision of the US and UK governments to go public reflects a loss of patience with Moscow after a series of cyber-attacks and hacks allegedly originating from within Russia. Photograph: Yui Mok/PAThe cyberwar between the west and Russia has escalated after the UK and the US issued a joint alert accusing Moscow of mounting a “malicious” internet offensive that appeared to be aimed at espionage, stealing intellectual property and laying the foundation for an attack on infrastructure. The Trump administration is coming in for an avalanche of complaints that it conducted military operations against Syria without having a strategy for Syria. This is inaccurate. President Obama had grandiose goals that he omitted to attain. He wanted Bashar al-Assad to go. He wanted the Russians to leave Syria. He wanted to promote democracy and protect human rights unless it became too costly (see: vacillation on military aid to Egypt). He wanted to advance the remit of international organizations and international law. His administration talked about “whole of government operations” but failed to conduct them. The Lubyanka building (former KGB headquarters) in Moscow, photo via Wikimedia Commons The Soviet Union was not vanquished by the West in the Cold War. It simply disintegrated in the late 1980s, the result of cumulative failures. A military defeat or a popular insurrection might have resulted in the elimination of its seventy-year-old totalitarian infrastructure and superstructure (the Soviet “deep state”). A mere collapse, however, had very different consequences. Beyond the abandonment of the Eastern European glacis and the formal independence of the fifteen Soviet Republics, the ruling Soviet elite stayed largely in place. This was especially true in the very heart of the Empire, the former Federative Socialist Soviet Republic of Russia, rebranded as the Russian Federation. The army and secret police stayed intact, the planned economy was turned into a state-controlled oligarchy, and nationalism was substituted for communism. Soon, Russia began to engage in systematic rebuilding and reconquest. It took 1,000 years for the invention of paper to spread from China to Europe. Nowadays, in a world that has become more integrated, innovations spread faster and through many channels. Our research in Chapter 4 of the April 2018 World Economic Outlook takes a closer look at how technology travels between countries. We find that the spread of knowledge and technology across borders has intensified because of globalization. In emerging markets, the transfer of technology has helped to boost innovation and productivity even in the recent period of weak global productivity growth. France’s Foreign Legion is the stuff of military legend: a band of mostly foreign men serving the French government essentially as mercenaries — and doing so with extraordinary success. Though the legion was formed in the 19th century to police France’s far-flung dominions, it has evolved into an all-purpose combat force. Indeed, thanks to its dependability in combat, the legion has become so useful that the French government is now significantly expanding it. Other European countries should follow France’s lead. All European Union nations need to do more for the Europe’s security — but their armed forces are struggling to find enough new recruits. The answer may be in plain sight; many of these countries have a growing population of young male immigrants who could be an asset to the military.